The moment of change for those who have stubborn weight issues is a difficult concept to grasp. How can you be eating everything you desire one moment and the next second make a decision that will change your life? It’s obviously not as easy as that. However, nothing worth having ever comes easy. Weight, whether it is 20 pounds or 220 pounds, is not easy to lose. It’s easy to put it on, but oh so difficult to take off. Still, there is a moment in time when things shift and everything becomes different. One moment I was eating everything I craved or wanted and the next I made a decision and headed towards health. I really never thought I would reach the moment of change. I knew others had, but I figured I was a hopeless case. After it happened to me, I recognized it as the key to becoming healthy, breaking free of addiction, losing weight and keeping it off. I also knew there are a lot of other ingredients that go into the weight loss soup mix. So I wrote my weight loss memoir, Sweet Grace: How I Lost 250 Pounds, in 2013. Along with it I developed the Sweet Grace Study Guide to help folks take the journey themselves. Yet, the key piece of the moment of change still seemed to baffle folks. I knew several months after Sweet Grace was released that I would write another book about the change process. Wrapping my brain around how to do that took another nine months or more. Yes, just like having a baby. What people really wanted to know was how they could have their own moment of change. What causes one person to change his or her mindset and lifestyle is different from that of another person. It’s not a one-size-fits-all diagram. How could I share a step-by-step plan then? The answer came as I started the Sweet Change Weight Loss Coaching Group. Those in the group were experiencing change, but each one’s change moment was different. Why and how each person made the decision was as unique as they were. Change motivators, such as being told one only has five years to live, might not be as life-changing to an individual as a two-year-old’s frank observation that his grandpa is fat. I began to realize stories of others’ change moments and transformations are great inspiration for others. So why not let people tell their change stories? I already knew several who had lost over 100 pounds. I would invite them and others to share their stories. Connecting them would be material regarding various aspects of change that I have experienced. I began contacting people, running into people, remembering people and being led to people who had a story of transformation. To my delight most everyone I invited to participate in this project did. The stories range from Sundi Jo Graham, who has lost 145 pounds, to those whose loss ranges from 20 to 109 pounds. Judy English, who lost weight 30 years ago, is still on her journey. Mindy Nave is just starting her’s. They range from Russ Hardesty, in his 70s, to Lindsey Summers, who is 20. Some have had issues with both alcohol and food. Some are bonafide sugar addicts while others have learned how to allow themselves to eat only small portions of things with sugar. The moments of change for some had to do with food allergies or other health issues. Other change work happened because the reality hit home they might not be around to see their children or grandchildren grow up. Some simply needed education and training about how to eat for optimal health. Some finally discovered a way of moving that was fun for them. One thing is common for all, they are discovering and implementing a totally new way of thinking and living. When you finish reading Sweet Change: True Stories of Transformation, you will have met 18 ordinary people (including me) who have turned around and headed towards health. These are men and women, young and old, who are busy living their lives just like you. In other words, they are people to whom you can relate. I know these individuals will inspire you as they have me. Their stories are examples of how God can work in any situation and circumstance to bring deliverance from addictions. In each chapter you will find information from me at the beginning and a personal change story written by one of the others. The first chapter includes my change story as well and some additional information. At the back of the book, you will find a final chapter from me, photos of those featured in the book, how to get additional resources and how to stay in touch with me. 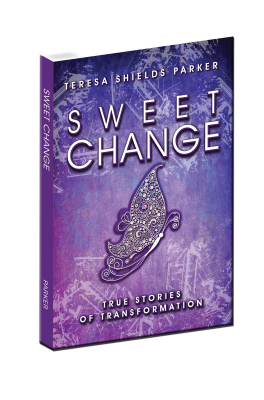 Sweet Change: True Stories of Transformation is a must-read book for any and all interested in transforming themselves—body, soul and spirit! By the way, when you finish reading, please go back to the Amazon page and put up a review. Oh, and if you prefer to check out a chapter before you purchase the book, download the FREE chapter HERE. Teresa Shields Parker is an author, transformation coach and speaker. Her books include Sweet Grace: How I Lost 250 Pounds and Sweet Change: True Stories of Transformation. Order print or kindle from Amazon or pdf from HERE. For more information on Sweet Change Weight Loss Group go HERE.